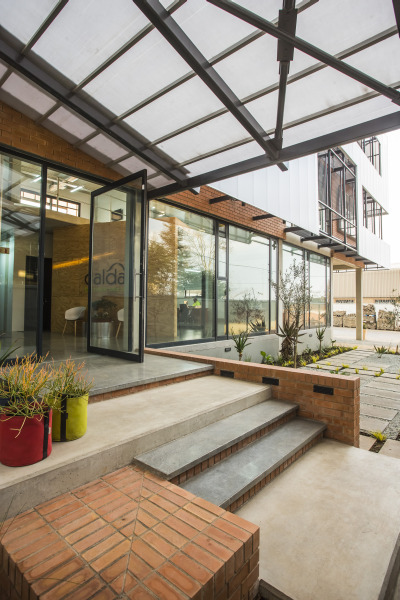 When Architects of Justice (AOJ) designed the geometrically striking industrial-chic office building for Caldas Engineering, a supplier of crusher parts to the mining industry, the 4 300m² rectangular site in Germiston met the company’s requirement for more yard space, but only had limited derelict office space. 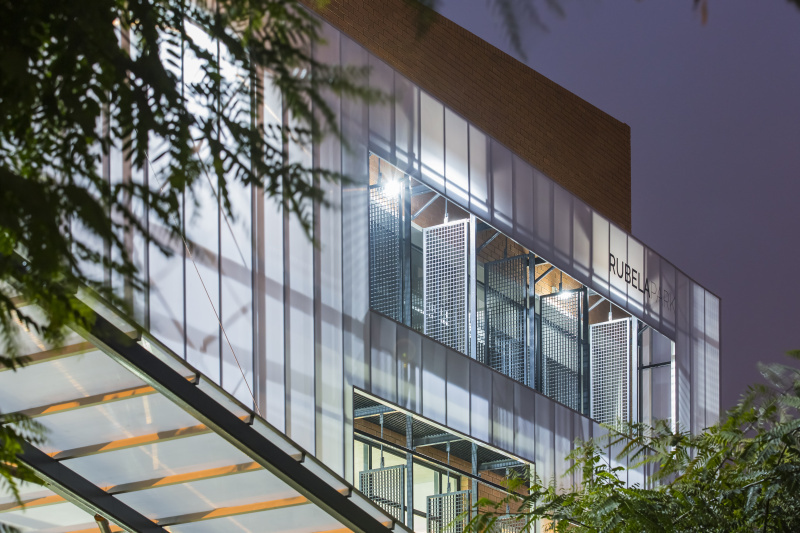 “The starting point for the design was to locate and size the new office building, named Rubela Park, on the site in order to maximise the yard space, while ensuring an optimal solar orientation,” principal architect, Mike Rassmann, explains. The position of the access road on the east boundary and the orientation of the site, which runs lengthways east to west, however, meant that laying the building out for optimal north/solar exposure would impede on the yard space and reduce the street exposure of the building. AOJ therefore paid close attention to the town planning requirements to get the maximum number of storeys in the building in order to reduce the footprint of the building. The entrance to the Rubela Park office building. After careful analysis it was decided to orientate the building lengthways in a north-south direction, with as much of the office space on the north side and all the service spaces located to the south of the building. As the length of the structure faces east and west, high, narrow clerestory windows were strategically placed to reduce heat gain from the west sun in the afternoons. 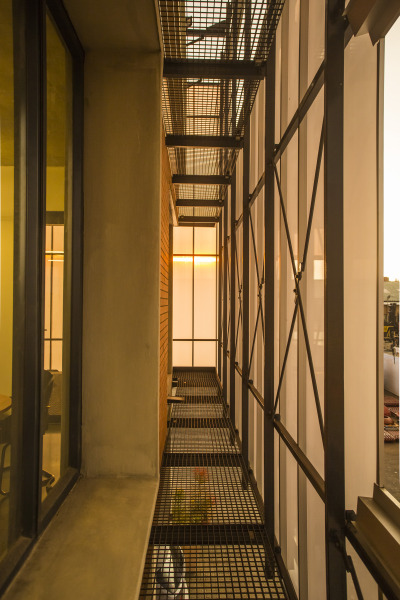 To optimise the amount of natural light entering the building and thereby reduce the electrical consumption of the building, a mezzanine level between the ground and first floors allows for a generous double volume, which meant that the size of the windows on the east facade could be maximised. Direct morning sunlight is dealt with by means of vertical louvres. In order to take maximum advantage of South Africa’s optimal solar conditions, a photovoltaic (PV) solar plant, for electricity generation, was installed on the roof of the building. To complement the green credentials provided by the solar facade controls and the PV installation, a large mono-pitch roof harvests rainwater which is stored in a 60kl tank above the ground-floor boardroom. This water is used for irrigation of landscaping and the washing of vehicles. Two of the client’s major requests were to keep the design of the building as cost-effective as possible and to minimise the amount of maintenance required on the facade. In order to achieve this, the building is essentially a modest and efficient rectangular face-brick box with an industrial interior, embellished on the exterior only by a simple external translucent polycarbonate screen, which not only moderates solar heat gain on the facades, but also provides much-needed shape and interest to the form of the building. In addition, the only paint used on the exterior of the building is on the ground floor, which is reachable without the need to set up scaffolding. After having occupied the building for a number of months, the client’s feedback has been only positive: “These offices have had a positive impact on our business in terms of it being representative of our brand, our staff comfort and the way our operations run across our facility. 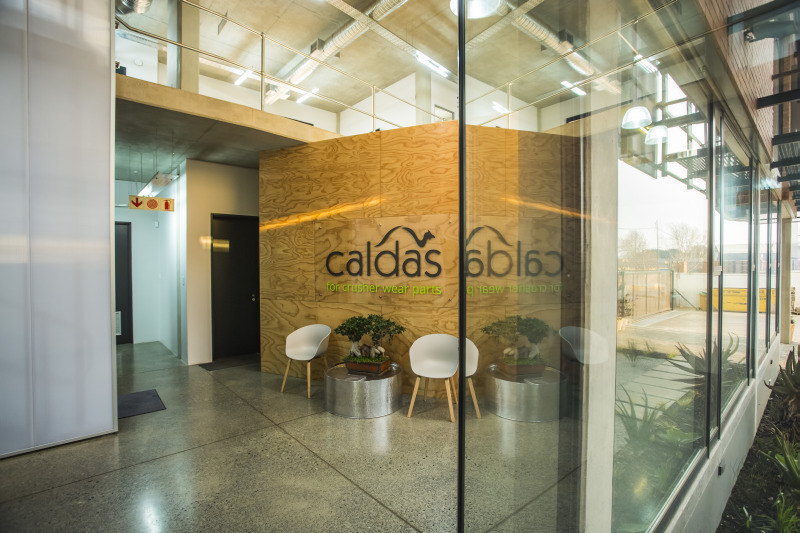 We are very proud of the sustainable features that have been incorporated into the building design and have found the building to be climatically responsive – providing a comfortable internal climate no matter the external conditions. “The careful sizing and positioning of the external windows mean that we require very little artificial lighting in the building during our operating hours. The design of the internal office layouts, careful positioning of the building on the site and strategic visual linking of certain departments to the yard space have meant that our operations are now more streamlined than they were at our previous premises. “This project really was about creating something low maintenance which looked great and, at the same time, operated on a sustainable level,” says Rassmann. 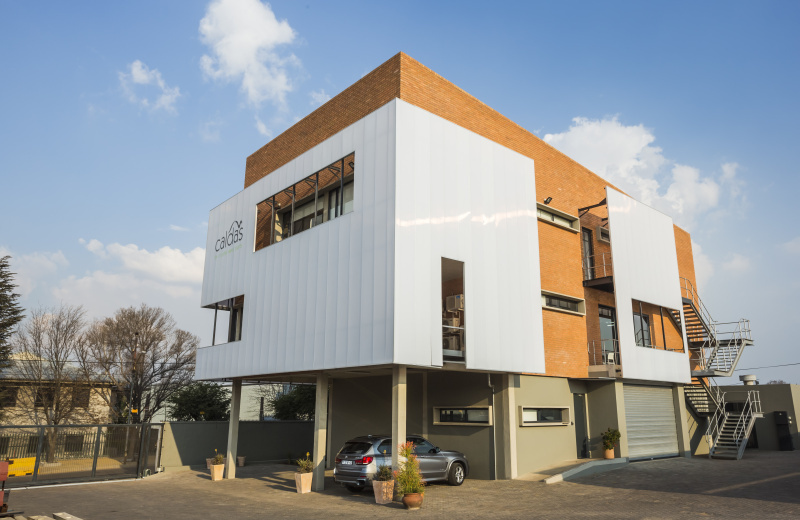 The project received a Gauteng Institute for Architecture (GIFA) award of commendation in 2017. Full thanks and acknowledgement are given to Architects of Justice for the information given to write this article. Caption: The Rubela Park office building is essentially an efficient face-brick box with a simple external translucent polycarbonate screen.